iBasso combines headphone amplifier and USB DAC in a single portable unit | What Hi-Fi? The pocket sized unit combines amplifier and USB DAC in a package weighing just over 100g, and is powered by an internal rechargeable battery good for 38 hours' use. 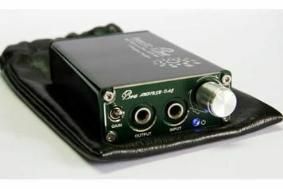 The D2 Boa can be used as a DAC/amp or just an amp, using the line input provided alongside the headphone output on the front panel, which has a two-position gain switch, while its USB input allows direct connection to computers. Digital conversion is via a Wolfson WM8740 DAC chip and TI PCM2706 converter, while the amp is powered by a 470mAh internal lithium-polymer battery. This can be charged via the USB cable supplied, or an optional mains adapter. The unit, which measures just 51x21x82mm, comes complete with a leather carrying pouch. HiFIHeadphones is planning to stock a complete range of iBasso products, including the even smaller T4, which is just 64.5x37x10mm), and weighs only 29g. Also on the way is the high-end P3 Heron, which will come complete with a selection of interchangeable op-amps, for those who want to experiment with such things.